While I was at the iMedia Connection Brand Summit a really funny/odd thing happened. In the opening minutes of the event there was a cocktail hour. My boss Brett Lofgren was running late due to a delayed flight, so I headed over to the event by myself. Now, this isn’t usually an issue with me considering I’m a pretty outgoing guy, but you know how it is. You get there, get a drink look around, don’t see a familiar face and all of a sudden you’re reduced to feeling like your 13 again. I thought that was going to be the way the rest of my evening was going to end up, until a young woman saw my name tag and stopped me. 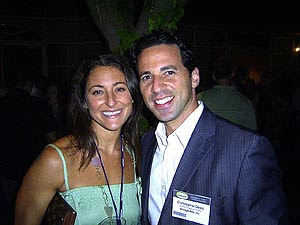 She introduced herself as Holly Lerner from Reuters, and in the same breath mentioned that she knew of Azoogleads, and stopped me because she used to work with Brett Lofgren (my current Boss)….when they were at Yahoo..what a small world! So we got to chatting, and discussing the event etc. Holly kept on saying to me that she felt like she knew my name from someplace else. She would look at the name tag, say Chris Dessi, hmmmm….then say “so sorry but I know that name from someplace”….well, we let it go and continued on with our conversation. About 10 minutes into our chat we started to discuss how Holly had come down to NY from Boston to live, and how much she loved NY. I agreed, and told her how my my wife loved moving into the city for the past year, but told her that the town Holly would really love is London. I told her I lived and worked there, and loved every minute of it. With that comment Holly paused and asked me the name of the company that sent me to London, so I said AGA, why? Holly let out a yelp, jumped up and screamed NOW I KNOW WHY I KNOW YOUR NAME! It turns out that Holly was the Sales Person that replaced me at AGA after I left. Now THAT is a small world. This is Holly and I at the Summit. Last night I flew back into New York from lovely San Diego, California. During my flight I was thinking about what an incredible show it was. The iMedia Connect Brand Summit had to be the most professional, organized, and efficient, conference I’ve ever attended in my ten years of my career. The crowd pleasing highlight of the event had to be the one minute speed dating. Imagine a room full of the largest brands you can imagine, all allowing you 60 seconds to hit them with your elevator pitch, and see if you can’t help their business in some way. Awesome, just awesome. I have to admit that at first I was a bit sceptical, but after getting past that initial fear, the session was fantastic. It was a breakneck speed, and you had to have your act together. In the end it was the ultimate ice breaker. After trying to tell someone about Azoogle, and then ask them what they do for say…Etrade, the minute was up, but now you can approach a familiar face at events later in the day. I was impressed by the pure energy of the attendants as well. Everyone was there not only to network, and have fun, but also to share learning, and to help make everyone better at online advertising and marketing. The round table discussions were incredibly informative. I mean, think about it…when was the last time you got to sit at a table with Sr. Level Executives at Doubleclick, Ave A, Sony, AND Revlon to chat about “what’s next in the online world”!! This is one conference that should be a “must attend” for anyone in the online world. Some of the topics discussed: CPA, CPM, Widgets, Intext Adveterising, Online Video ads, Podcasts. I’ll be at this show until Thursday of next week, and heading to Shop.org the week after in Las Vegas! Shop.org is the association for retailers online. I’ve attended this show in the past, and this is a top notch event that I recommend everyone attend. You are currently browsing the Christopher Dessi blog archives for September, 2007.